Remember those 60’s plastic vacu-formed masks we wore as kids? (Okay, I’m old.) Anyway, I reproduced five of them into a festive Halloween garland. The retro graphics are so wonderful! There’s a pointy-toothed devil, a wicked witch, a bulbous-nosed pirate, a drippy Frankenstein and a happy scaredy cat. They were photographed, cleaned up, and then heat-transferred onto a piece of stiff white wool felt for stability and durability. I then cut them out by hand. (I even cut their eye-holes out!) They are beautiful reproductions, each sized about 3 1/2″ x 4 1/2″ (8.89 x 11.43 cm). They are strung onto a 5′ (1.5m) piece of black and white baker’s twine. You can arrange the placement of each image as you like and they will stay in place once arranged. I made sure they hang upright, whether you have them floating in space or against something. The twine is 5 feet (1.5m) long. 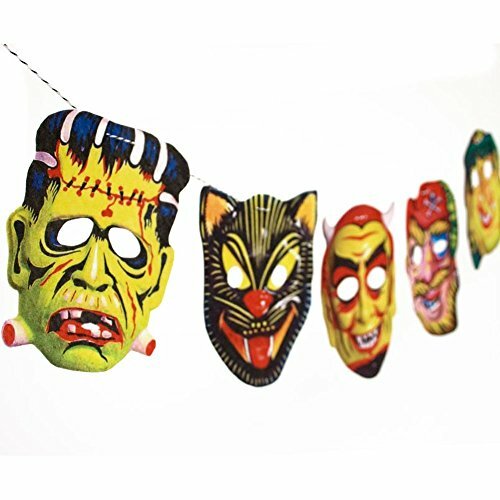 This humorous garland deserves showpiece status in your funky, retro Halloween decor. It will bring back good memories for you or your parents or your grandparents. (Whatever, you’re probably young.) I am sure you will enjoy this Halloween decoration for years to come, but please do not hang in full sunlight as some fading will occur. Each garland comes packaged in a cellophane envelope with decorative header. I’ll be happy to include a gift card and mail out to a friend as a fun surprise gift. Thanks for looking!